It kind of scares me to press publish on this post. I've had it as a draft for a while, unsure whether to post it or not as I want to be positive and inspire on here. And I am still going to do that, I still want to spread positivity and inspiration, but I amnt going to lie either. But also I think it's important to speak out about these things, because if I make myself feel like I'm wrong and feel guilty, then I am adding to the stigma of mental illness. Depression is not just self harm scars and black and white pictures. It's not a moody, tired girl with a bad attitude and too much make up. Depression is sitting on the floor of your room crying because you don't want to feel this way anymore. You want the thoughts, the anxiety, the feelings to stop. Depression is getting anxiety and guilty feelings because you feel like an awful girlfriend because you are no longer the happy and smiley girlfriend and instead feel like a burden to him. It's feeling guilty because you don't want to put your family through the same thing again, you don't want them to find you crying and don't want them to see you in pain. Depression is faking a smile but wondering which way is the best way to end your life. Depression is not knowing how to answer the question "how are you?" Because you no longer know how or what to answer. You don't want to tell the truth or tell a lie either, so you just don't answer at all. Depression is spending 30 minutes staring at your phone and the text message received, not knowing how to answer. You know you would feel better if you left the house but you can't physically get yourself to say yes. ... so you just don't answer at all. Depression is like having a constant pounding headache, making it hard to concentrate or think. Depression is not physically able to get out of bed. Gravity pulling you down, your body feeling heavy, your head pounding and all you want to do is sleep... no matter what time it is. Depression is always feeling tired, sleeping at weird times but unable to sleep at night. For me, it also includes nightmares when I do sleep. Depression is wanting to cry because everything feels like too much or you just feel so unhappy. You have to hold back the tears even when you know that you should feel happy, which makes you feel even worse. Depression is waking up in the morning and not wanting to be awake. Not having that energetic and motivating feeling. No smile on my face, just wondering how will I manage another day. Depression is too many thoughts, to many negative and black thoughts. Thoughts of feeling worthless, life is awful, life isn't worth it, thoughts about death. 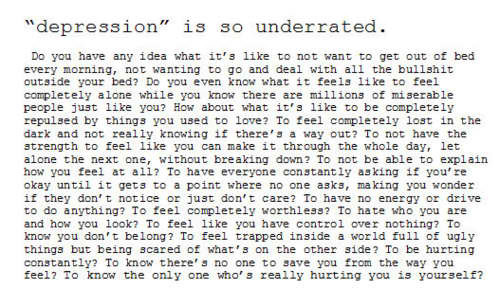 Depression is a great cloud about your head, like walking in fog... you can't really seem to communicate with others. Your there but not really. You get lost in your own dark thoughts which pull you deeper in and eventually yiu feel so lost, so out of contact with others that you isolate yourself. Also the fact that you don't have the physical or mental energy to socialise. It takes too much to put on clothes, to get out of bed, to fake that smile. It takes to much to try to be positive and try to be the person you once were. Depression is wondering if you will survive until your next birthday because at the moment it doesn't feel like it. But these feelings are not forever. I know that. I have suffered depression several times before and each time is just as awful, and each time I wonder how did I manage to keep going. How did I break free.... Because all you want to do is sleep... sleep away the feelings and thoughts, but at the same time when you sleep you get nightmares which you want to run from. I know this isn't forever, I know I can find myself again. I know I can be happy and positive again, find my reason to live and keep going. I just need to fight.... I cant let this grey and dark cloud take over. I can't let it win. Depression is something which is important to talk about. Not have it stigmatised and taboo . People suffer from mental illness, mental illnesses which result in death if not treated. Mental illnesses which stop people from living life properly and it is NOT their fault. They do not choose the illness, they are a sufferer, just like someone with cancer is a sufferer of their illness. Someone with an eating disorder or depression suffers from their illness. It is important for society to realise that mental illnesses need proper help, not just lock people up in different treatment centres or psychiatric units and think that they will get better. They need all round help and most of all, not be made to feel guilty. Sufferers feel bad enough as it is, without having society make us feel like odd people who are weird or dangerous. . I am speaking out because I don't want people to feel ashamed and I believe it is important for society to not stigmatise mental illnesses. I am not writing this post to get sympathy, but i am writing it because the stigma around mental illnesses needs to stop. Depression and eating disorders arent a joke, and they arent something that just pass... but they are a battle, and people may not look like they struggling even if they are. People dont have to be underweight to struggle with an eating disorder and people dont need to have visible self harm scars to suffer from depression. It shouldnt have to go to the extreme that someone is on the verge of death or tries to commit suicide before they get the help they need. I will be ok, even if it doesnt feel like it now. But i know i need to write this post, I am struggling and i cant deny that. It doesnt help to put on a smile and fake it when all i want to do is give up on everything and isolate myself. I have struggled with depression before, i can get through it.... even if it takes time. I will be happy again, even if i am not happy right now. I am going to focus on positive posts and spreading positivity. Because I know that will help me and help others. Just focusing on the negatives and negative thoughts won't be good for anything. But I felt I had to write this post as well. You are brave to post this and it is very well written. I feel like it is hard to open up to anyone who hasn´t suffered from depression, because they just make you feel guilty when saying things like "people have it worse" or "just think positive" etc. Psychiatrists or psychologist aren´t very helpful either, when they write you pills with lots of side effects and pills to cure those side effects. They just give you a potentially lethal cocktail of pills to overdose with. Is there really a cure for depression? I think there is not, You either fight it yourself or you give up. I hope you fight it. Depression is thinking about how happy you would be if you were productive, planing to do just simple things (learning, cleaning up, etc.) and waking up the next morning to doing nothing but stay in bed. Sadly I can relate to this :( and the Quote "you see that girl?.." thanks for this posts. It makes you authentic. You are so strong girl! I really look up to you! Thanks for creating this blog! You'll get through this. Try to talk to your family and/or boyfriend about your thoughts. You know so much about this topic and I feel a bit silly to advise you to talk about your feelings, but I want you to feel better. Take one step after the other to get through this phase. You will make it! Hope you don't feel confused because of my comment. Ah Izzy, it's awful you are going through this again. I can relate to this post, when my depression was bad I didn't want to live, everything felt hard and unbearable. Please, reach out for help before it gets worse; it's more difficult to fight it alone. Perhaps you need some time to relax and find out what is causing this? I can relate to it, too. Thank you for speaking out. It takes patience and acceptance for needing more rest than you want to take. Sometimes it helps me to just smile even though I don't feel like it. But other times it just makes me feel worse and dishonest. Then all I want to do and all I can do is to just feel what I feel, knowing that the energy will come back. Jag vet precis hur du känner dig, kram izzy, önskar jag kunde verkligen ge dig världens största kram, och berätta hur fantastisk och inspirerande person du är.